EdgeParties in D.C. and L.A.
hosted by John Hagel, JSB, plus William Eggers, Grover Norquist, and Darrell West. 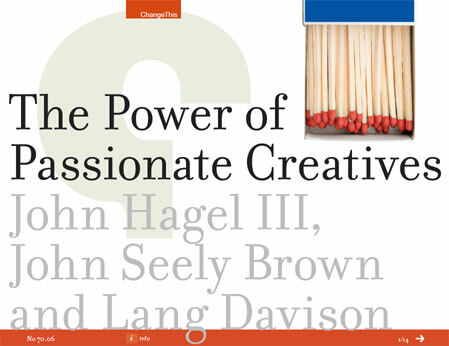 hosted by John Hagel, JSB, plus Jonathan Aronson, Johanna Blakley, and Jonathan Taplin. John Hagel on the power of “pull” from Nieman Journalism Lab on Vimeo. Do you use social software at your company? The cases we develop will be highlighted in a publicly available, eminent research paper published later this year. Cases may also appear in some of our other publications (like our Harvard Business Review blog). All your information will be treated as highly confidential, and we will not share it without your approval. N.B. - We define social software as collaborative tools used internally such as wikis, discussion boards, blogs, microblogs, idea trading/prediction markets and social networks that enable employees to communicate across boundaries, identify expertise, and access institutional memory. Using social tools for Social CRM and other marketing efforts externally is not in scope for this research. John Hagel told a story about Chris Anderson, Wired magazine editor and his side-project - Drone aircraft - and how he found a guy to be his CTO who knew more than anyone else about drone aircraft - only to find out he was a 19-year old high school dropout from Tijuana. He never would have found him via a traditional search. John Seely Brown talked about how construction contractors are actually good examples of 'pull' because of the underlying trust networks. A second business model takes an equally contrarian approach to production. John Hagel and John Seely Brown, who run Deloitte's Centre for Edge Innovation, argue that Western companies have spent the past century perfecting "push" models of production that allocate resources to areas of expected demand. But in emerging markets, particularly those where the Chinese have a strong influence, a very different "pull" model often prevails, designed to help companies mobilise resources when the need arises. Hong Kong's Li & Fung or China's Chingquing Lifan Group can use their huge supply chains to produce fashion items or motorcycles in response to demand. Taiwan's Quanta and Compel can produce cheap computers and digital cameras for a fashion-conscious digital marketplace. These pull models fundamentally change the nature of companies. Instead of fixed armies looking for opportunities, firms become loose networks that are forever reconfiguring themselves in response to a rapidly shifting landscape. Such models are not peculiar to emerging markets: Dell builds computers to its Western customers' specifications, and Western management gurus have been advocating networks for decades. But according to Messrs Hagel and Seely Brown they are far more widespread in emerging countries. To access live-streaming on the web, go to www.npr.org and click on "listen", the drop down will say "NPR 24 hour Program Stream" and you'll be able to listen to the program there.